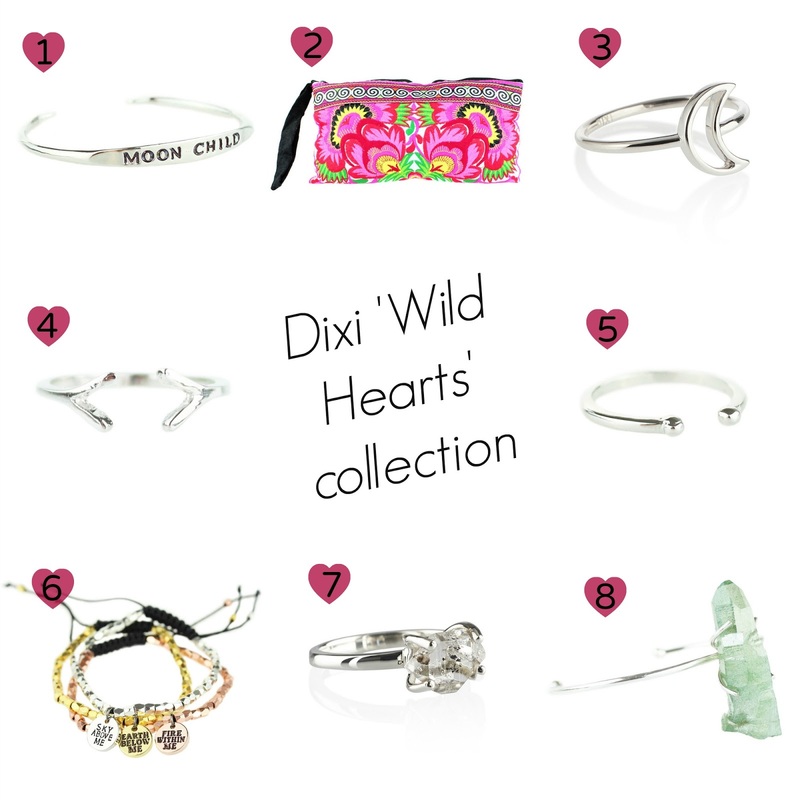 One of my favourite online jewellery shops is Dixi and a few weeks ago they launched a new collection called Wild Hearts, which includes over 100 new products. Not all of their jewellery is to my taste but am particularly partial to their midi rings and several other items also caught my eye so I thought I'd do a post to show you my top picks from the collection. As I said I'm partial to a midi ring or two and there are several new midi rings in the Wild Hearts collection. The ones that have particularly caught my eye are the Open arms midi ring (4) and the Santiago midi ring (5). Both are made of silver plated copper (nickel and lead free) and are just £6 each. The standard rings that caught my eye in the collection are the Herkimer diamond ring (7) which is available in sterling silver for £36 and silver plated brass for £26 and the Midnight moon ring (3) which is sterling silver and £28. The Midnight moon ring was already on the site (I've had my eye on this one for a while now!) but has obviously been relaunched in the new collection. The Moon child bracelet (1) you can also get in the same design but with 'Ocean child' or 'Wild hearts' on. These are £16 each and are available in polished silver, antiqued silver, gold and rose gold, although all finishes are not currently available across all bracelets and sizes (I'm assuming stock may follow later). The Sky above me, Earth below me and Fire within me bracelets (6) come in a set of three for £30. These would be great for a layered festival type look and can obviously also be worn individually or maybe split between friends or maybe siblings. The last bracelet that caught my eye was the Sea dancer green aura bracelet (8). This is also available with an aqua stone and they're £36 each. This may not be the most practical of bracelets as the stone might be a little chunky on your wrist and may catch on things (also it's on an open bracelet so you may run the risk of knocking it off) but just look at how pretty it is and the stone will vary in size and shape on different bracelets so it would kind of be unique to you. Finally the very pretty Treasure island clutch bag (2) caught my eye because of the gorgeous bright colours. These are fair trade handmade by the Hmong women in the hill tribes of Thailand and feature a wrist strap, zip closure and inner zip compartment. This has a width of 11" and height of 6" so it's actually quite large and very reasonably priced at £24. If any of these items take your fancy why not head over to the Dixi website and take a look at the whole collection. What's your favourite piece from my selection? The 'Treasure Island' clutch is so pretty, I love those colours! Such a nice collection.